That means the best advice I could offer would go a little something like this: Try to find a way to bribe Theo Epstein to come to town, wait five years and then – bang – World Series parade down Broad Street. That doesn’t address the reality of the situation as the Phillies are out in Chicago battling the defending World Series champions. I know somebody who can help, though! In fact, I called in a favor and sent your question to our in-house Phillies expert Ryan Lawrence for a proper answer. These appear to be two different questions, since good and great are not one and the same. The 2003-06 Phillies were good. And then the team was great for the next five years, through 2011. "Good" is an improvement from their current lot, surely, and maybe another question(s) should be when will the Phillies be relevant or fun again? Perhaps I'm just filibustering here. They are relevant and fun right now! (Read: read/bookmark my stories on phillyvoice.com/tags/phillies, thank you very much). OK, fine, I'll answer your stupid question as best as I can, since there really isn't a definitive answer unless you let me borrow some plutonium and a 1983 Delorean. I believe that, if everything breaks right, and this is asking for a lot, for at least two or three of their prospects to hit (hit, as in meet their expectations as players, and not hit literally, although that would also be helpful, too), for three or four of the young pitchers in the current rotation/at Triple-A to be productive and consistent, for Maikel Franco to be the player everyone thinks he can be (but isn't at the moment), for two others in the current lineup to play well enough that there is a legit argument about whether a prospect should be taking their job, etc. etc. etc ... then they could be "good" toward the end of the 2018 season. Good. Not great. Let's also assume they'll hit the free agent market next winter, a year before the Free Agent Bonanza of 2018-19, and add pieces that are improvements on the one-year stop gaps they've added in recent years. Speaking of that Free Agent Bonanza of 2018-19, I think the team can be more than good in 2019, if all of the aforementioned "ifs" continue to play out and John Middleton opens his wallet (as he can't wait to do) to plop a perennial All-Star/MVP candidate into the middle of the lineup, a player who is both a box office attraction and a pillar for a lineup of young-and-upcoming players (think adding Jim Thome to the Bobby Abreu, Jimmy Rollins, Pat Burrell, and, eventually, Chase Utley). If they can do all of that, and locate a legit, top-of-the-rotation starter in the next three years, too (maybe one of the current guys reaches that status, maybe it's fireballing A-ball teenager Sixto Sanchez), then I think that the possibility exists for the Phillies to be "great" in 2020. Perhaps that's fast-tracking it, but, again, it's under the premise that all of those ifs listed are no longer ifs. If you feel more comfortable with 2021, fine. Go with that. "Good" in late 2018 or in 2019. "Great" in 2021. So, there you have it. May the day come when the Phillies win every game they play (against teams not named the Chicago Cubs)! Thanks for directing me to that link. It’s an innovative approach to addressing an international problem. That said, what (potentially) works in Portland, Maine may not work in the much larger Philadelphia, Pennsylvania, where officials have long grappled with – ideas both good and ill-advised – the issue of homelessness. Portland’s overall population is some 66,000 people. Philadelphia’s estimated homeless population is about one-tenth of that. The story indicates that Albuquerque and Chicago have instituted programs along those lines. That’s a good thing. 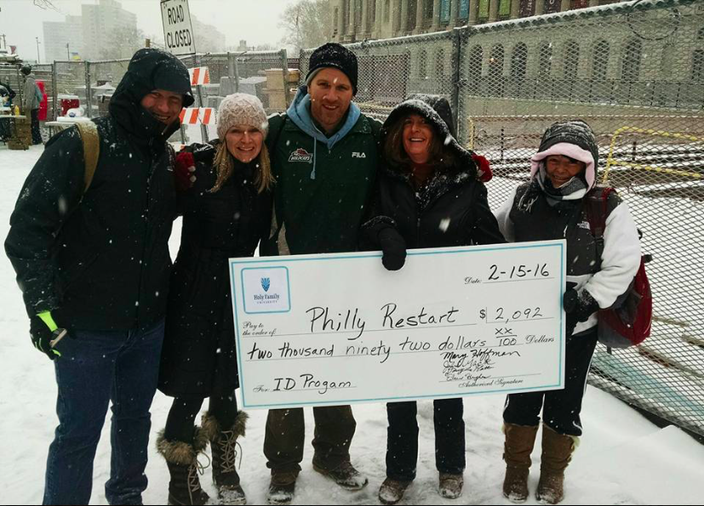 Philadelphia has already proven to be a pioneer of sorts in this area, with the blue-jacketed, Doe Fund's “Ready, Willing & Able” program that has worked to break “the cycles of homelessness, addiction, and criminal recidivism by providing paid transitional work, occupational training, housing, and comprehensive support services to homeless individuals” since 2001. Also helping the homeless locally are (as I learned during a visit last week) the Sunday Breakfast Rescue Mission and (as I’ve respected for as many years as I’ve lived in Philadelphia) Adam Bruckner, who’s still out on the Parkway helping the homeless get identification which, in turn, helps them get jobs and shelter. Adam Bruckner (center) has, for years, written checks to help the homeless get proper identification that will enable them to get jobs. They are far from the only ones trying to remedy a societal shortcoming. I took your question to Elizabeth G. Hersh, who is director of the city’s Office of Homeless Services. The purpose is to “address a range of rules” in regards to parks, streets, transit areas and the like. It looked specifically at the issue of panhandling, which has been deemed a free-speech activity rather than branded illegal. Which is to say, jobs, like those you asked about. As things stand today, the committee is gathering information about effective local programs like "Ready, Willing and Able," Project HOME’s cafe and bathroom-attendant program and the “One Step Away” homeless newspaper. That local investigative effort started this spring, Hersh said. Their next phase will take a look at national programs, like the one you broached with this question. “We’re going to look at the programs, learn about them and begin to think about what can be replicated here,” she said.